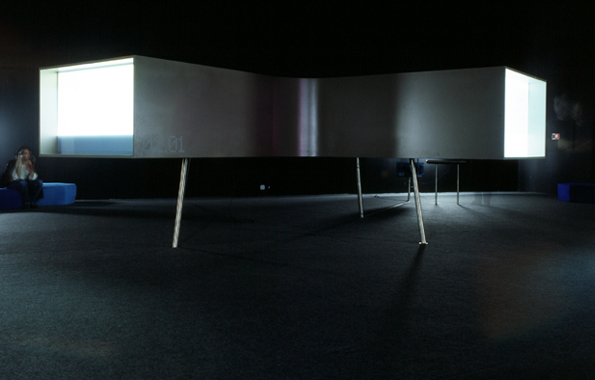 Multimedia installation for Voyager, an itinerant exhibition by ExperimentaDesign. I developed the multimedia software and hardware integration for Terminal 2 (image module) using video sampling and interactive technologies. 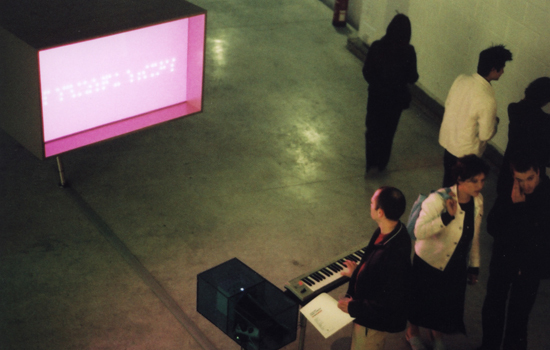 A MIDI controller allowed visitors to access a collection of computer based movies clips showcasing work from two distinct disciplines: dancers/choreographers present ultra short pieces specially conceived for computer manipulation. Graphic designers (me included) presented a selection of short films, animations or still images documenting the core of their modus operandi. Voyager is an installation/exhibition on Portuguese creativity and it is, also, a communication operation, designed to be shown both abroad and in Portugal. It is itself a motive, a possibility of creation, since all the contents it showcases are original. It constantly explores and experiments new exhibition formats, searching new and more effective ways of reaching the general public. It is a creative collaboration strategy, since every time it is presented somewhere, it challenges creative artists and counter parts, and establishes networks of cooperation and exchange. 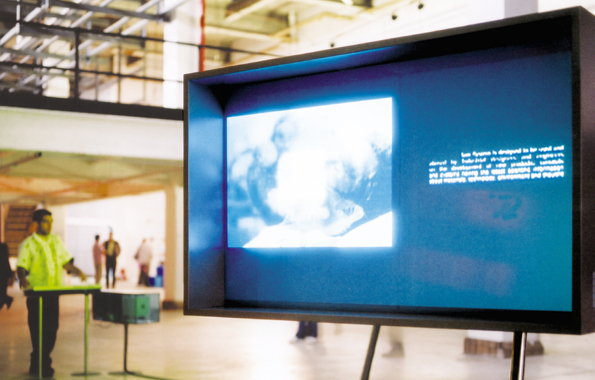 Voyager’s founding concept featuresa marked character of ex­perimentation, exploration, intermingling of disciplines between creative practitioners and other cultural agents. It challenges various artists and designers, aiming at creating an image, of the many possible, of Portuguese contemporary culture. It works on the notion of movement, displacement, open space, time and speed. Voyager is a project associated to ExperimentaDesign and it represents, in the scope of the Lisbon Biennale, an extraordinary field of creative possibilities, contributing to create an image of a contemporary Portugal that is defined according to the rhythm of the participants proposals and the curators’ orientations.